Based on reviews from 428 experts and 58,905 users. Learn how our rankings work or see our guide to purple running shoes. Updated Apr 2019. The color that is intermediate between red and blue is purple. With the combination of the color blue and red, the balance of calmness and stimulation is embodied. Purple, being one of the three secondary colors, can neither or simultaneously be cool and warm. People think that purple and violet are somewhat similar, but actually, it's not. Purple is a composite color while violet is a spectral color with its wavelength in it. This wavelength is described to be visible in the spectrum of light. In history, the color purple and violet have been associated with majesty and royalty. It is described as an imperial color which is worn by Roman magistrates. In ancient Rome, specific categories of citizens and priests use the Toga Praetexta. This toga is described as an ordinary white toga which has a broad purple stripe on the border. Curule magistrates, rulers of the Holy Roman Empire and the Byzantine Empire, and freeborn Roman boys wore this toga as well. During the Christian era, the purple color was continually used by the rulers of the Byzantine Empire for imperial documents, diplomatic gifts and in the pages of the Bible. During that time, fabric with squares of purple is worn by government officials to show and emphasize their rank as well. In the Mediterranean, the color of nobles, magistrates, kings, and priests was the Tyrian purple. The dye produced from sea snail is known as the spiny dye-murex or Tyrian purple. When planning to buy the right purple running footwear that best describes your personality, a lot of factors should be considered. Do not only focus on the color but also to the shoe's versatility and quality. It is essential to assess the shoe's performance as well. Byzantine, Dark Magenta, Antique Fuchsia, Boysenberry, Eminence, Light Orchid, Lavender, Mystic Maroon, Opera Mauve, Bright Ube, Palatinate Purple, Pale Plum, Pastel Violet, Patriarch, Phlox, Philippine Violet, Psychedelic Purple are some of the color variants that are usually used in different brands of running shoes. Here are some of the examples of running shoes that have these color schemes: Brooks Pureflow 6, Nike Revolution 3, Nike Flex Trainer 7, Asics Gel Venture 5, Nike Free RN Flyknit, Asics Gel Sonoma 2, Puma Flexracer, and New Balance Fresh Foam Cruz. When choosing the best purple running shoes, always keep in mind to look attentively at the footwear's performance. Other shades of purple are Pomp and Power, Mardi Gras, Maximum Purple, Munsell, Purpureus, Razzmic Berry, Medium Lavender Magenta, Rose Quartz Pink, Vivid Mulberry, Steel Pink, Midnight, Thistle, Medium Orchid and Pearly Purple. In purchasing a running shoe for men and women, the price range is vital. These are some of the shoes that are based on RR’s popularity rating as of the 2nd half of 2018. This list may help you decide on what to choose. Inov-8 Trail Talon 250. The Inov-8 Trail Talon 250 is a running shoe that is described to be lightweight in structure. It has a semi-curved design that is essential in adapting to the natural shape and movements of the foot. As a result, users are sure to experience a more comfortable ride when running, walking and standing. The utilization of high-quality materials makes the platform long-lasting and durable for the runner to wear in short and long-distance runs. It uses a hard and sticky rubber that provides the right amount of traction on different weather conditions. Reebok Speedlux 2.0. The Reebok Speedlux 2.0’s primary purpose is to provide an enjoyable running experience to the wearer. The shoe garnered a mix of negative and positive comments when it comes to its design and structure. With its style and construction, the platform ensures to cushion every stride. Smooth transitions in every direction are also offered by the footwear. It is sure to take every runner in short and extended running sessions to the next level. Reebok Runner. The Reebok Runner is a running shoe that is best suited for the roads. It accommodates the runner who has a medium-sized foot. With the shoe’s impressive design and construction, it performs well on a wide variety of paved surfaces. The midsole area uses the foam technology which delivers a more responsive ride. Its ability to secure the foot during the activity allows the user to comfortably wear the shoe throughout the running session. Reebok added the Memory Tech in the sock liner. This component of the shoe is sure to conform with the exact dimensions of the foot which results to a safer and more comfortable fit. The Reebok Runner’s outsole provides the right amount of traction throughout the activity. This material’s durability is believed to last for extended period of time. Reebok Ahary Runner. For a price that's reasonable and affordable, this lightweight trainer has made a lot of users contented and happy because of its fantastic arch support, flexibility and excellent cushioning. The upper section is composed of a breathable mesh that promotes proper inflow and outflow of air. This mesh is essential in providing a healthier foot environment. It is sure to keep the foot fresh and dry throughout the running activities. Salomon XA Pro 3D CS WP. The Salomon XA Pro 3D CS WP features components and technologies that bring warmth and comfort, especially during the winter season. These components include the EVA footbed, full-length injection-molded EVA in the midsole, 3D Advanced Chassis system, thick Sensifit overlays, QuickLace system and the CS WP technology. With the combination of all of these materials, runners are sure to improve their performance and excel in different types of challenging trails. Here are the five popular purple shoes best for trail running. These shoes are based on RunRepeat’s popularity score as of the June 2018. Salomon Speedcross 4. In the 4th installment of the Speedcross series, Salomon did not change a lot of the version's features and components. The notable change in the Speedcross 4 model is the outsole section. Being a trail running shoe, full-sized lugs are used in the underfoot. This material is essential in providing grip on uneven and challenging terrains without quickly damaging the shoe after several uses. Asics Gel Venture 6. The Asics Gel Venture 6 is a versatile trail running footwear that is ideal for users who have neutral foot mechanism. With the utilization of a soft cushion, added comfort is offered. It features the aggressive lugs which aim to deliver an excellent grip on a wide variety of surfaces. The upper design provides a snugger fit. In general, the Asics Gel Venture 6 is a good option for most individuals who are seeking an all-around shoe without spending too much on its price. Asics Gel Sonoma 3. The Asics Gel Sonoma 3 is an updated version of the Sonoma trail running shoes. The shoe is strategically made for those who are neutral pronators. The upper unit is composed of durable mesh. Because of the use of this material, the foot is covered and protected against the hazardous nature of the trails. With its excellent performance and quality, many runners were satisfied and happy. Brooks Cascadia 12. For runners who wish to experience an agreeable and precise performance, the Brooks Cascadia 12 is an excellent choice for them. The shoe utilizes a breathable mesh in the upper area resulting in a more comfortable and secure fit. Along with the breathable mesh upper, the element lining is also an added material to the platform. It is described as a moisture-managing fabric that promotes a healthier and fresher foot environment. Salomon Sense Ride. The Salomon Sense Ride features a Premium Wet Traction Contagrip outsole. This feature of the shoe aims to provide non-slip traction for a wide variety of trail surfaces. The zones of the outsole are composed of a harder or softer rubber which depends on the areas where they are placed and used. Contagrip is described to be a combination of different compounds that have different densities. Below are the five purple road running shoes. 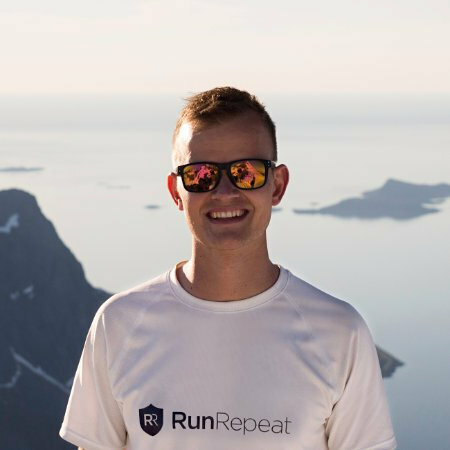 The list is based on RunRepeat’s popularity rating as of the 2nd half of 2018. Nike Air Zoom Winflo 4. Nike has made some changes to the 4th model of the Air Zoom Winflo. The primary goal of these changes is to ensure additional durability and comfort and durability for the wearer. The footwear features the padded tongue and collar. The goal of which is to provide the runner with a better cushioning system. A cushion crash rail is also added to the shoe to allow a smoother heel-to-toe transition. This technology offers a comfort ride even in long-distance and short-distance walks and runs. From the landing to the toe-off phase, it lessens the possibility of any injury from all the impact. Adidas Ultra Boost. The fit of the Ultra Boost is unbelievably snug and comfortable. With the utilization of generous padding all throughout the footwear, users with medium measurements and dimensions in their feet are sure to appreciate its wide toe box and adequate space in the heel. Adidas’ outsole is essential in adapting and stretching the rubber to its maximum level to encourage power in every stride. Brook Ghost 10. The Brooks Ghost 10 is one of the most visually-appealing shoes that a runner could have. Because of its excellent cushioning system, users can experience a hassle-free and seamless ride. Many of the runners admired the stable heel-to-toe transition of the shoe as well as its design, lightweight construction, and durability. It features a unique outsole design that aims to provide added flexibility to the platform. Adidas Alphabounce. The Adidas AlphaBounce has been strategically-made to have a nature that is multipurpose. It has a FORGEDMESH that accommodate the shape of the foot. This flexible material can expand naturally which results in a more comfortable interior foot chamber. It features an outsole unit that is described to be versatile and durable. The flexible but sturdy rubber aims to deliver added protection and traction. It has the ability to withstand moderately rough and smooth surfaces including asphalt. The utilization of the seamless construction of the upper area results in a more comfortable and agreeable footwear. A soft fabric makes up the inner lining of the shoe. When the foot is inside, it feels like a sock. Nike Flex RN 2017. The Nike Flex RN 2017 is a road running shoe that is great for users who have neutral pronation or supination. Phylon is the primary midsole unit of the Flex RN 2017. Because of this material, the entire foot is cushioned throughout the running activity. To expand the shoe's lifespan, a dual-density nature is utilized to prevent the possibility of early breakdown. The overall response of runners for the Nike Flex RN 2017 has been very positive. They were happy and contented with the footwear’s excellent construction and design. The color purple is associated with ambition, luxury, power royalty and nobility. In general, the purple color communicates positively. Regardless of the culture, gender and age, almost everybody can relate to purple. It also represents magic, grandeur, wealth, independence, extravagance, mystery, dignity, devotion, pride, wisdom, and peace. It is believed to encourage creativity, calm nerves and power to uplift which makes it an all-inclusive color. Most adolescent girls choose this color as their favorite color. Here are the four specific things that purple is said to communicate. Bravery - Purple is a symbol of bravery. As defined in the dictionary, bravery is the admirable quality of showing or having the moral and mental strength to face any fear, danger, and difficulty. Value - The notion of royalty is caused by the purple color to communicate a sense of value. When we say value, it estimates the monetary worth or amount of something. It is also defined as one's judgment and the principle of what is really important in life. Because of this reason, the highest value in the poker chip which is $5,000 is purple-colored. Sacredness - In the natural world, purple is considered to be sacred. In Egypt, purple is a symbolism of faith and virtue. In Christianity, purple is usually associated with the Lent and Advent season. In Tibet, the purple-colored stone and amethyst are considered to be sacred, especially to Buddha. Royalty - Purple is the royal color of the Caesars. When wisdom and love unites, it symbolizes royalty and justice. During the ancient times, a purple glass is stained with the colors blue and red. Blue represents wisdom while red represents love. A universal connection that a lot of people make with the purple color is its association with prestige, royalty, and nobility. In Japan, purple is associated with wealth and status. There are some things to consider in taking care of your purple running shoes. Here’s a list of the things that you should remember to maintain the appealing-look of your purple running footwear. Take on and off your running shoes correctly. Always make sure to loosen the laces of the shoe before you take them on and off. Bending the upper unit, collar, and lacing system is often the result of shoving your foot into the shoe. Because of this, the stitch and glue that holds the purple running footwear together are stressed. Don't be tempted to take your shoes on and off without untying the laces, especially when you're in a rush. Alternate two pairs of running shoes. If you are interested in running every day, it would be beneficial to have two pairs of running shoes. One tactic is to start wearing a new pair after 1 to 6 months of wearing your current pair. Your footwear is sure to last a more prolonged period if you give them a time to dry out and decompress every after a workout. In this way, you will also determine when is the right time to replace your shoes. Dry your footwear properly. There are times that you cannot prevent your shoes from being wet due to different weather conditions. It is then essential that you correctly dry your running shoes. Don't put your footwear on direct heat. It will destroy the adhesives and materials that put them together. The best way to dry your shoe is to remove the insoles and let it air dry. You can also set a crumpled newspaper inside the shoe to help them dry faster. Do not ever put your running shoes in the clothes dryer and washing machine. If there is a necessity to clean your shoes after an activity, always use a mild soap, warm water, and scrub brush to sanitize them. Let your footwear dry in the air naturally. By doing this, you are lengthening the lifespan of your purple running shoes. You can also use a fan in drying your shoe. Store your shoes properly. Heat is the number one enemy. Always keep in mind to keep your running footwear in a dry and cold place. Maintain the shape of your shoes. After washing and rinsing, stuff your purple running footwear with used clothes, small towels, newspapers or socks to help maintain the original shape of the running shoe. These materials are essential in preserving the look and beauty of your shoe. It will also aid in absorbing moisture. Prevent shoe odors. One of the effective ways to eliminate shoe odors is using the baking soda. To neutralize the smell of your purple running shoes, sprinkle baking soda overnight. This will remove unnecessary odors. What is the best way to break in a new pair of purple running shoes? Wearing your new shoes around the house for a couple of days is a helpful way to break in your purple running footwear. This idea is essential to ensure the shoe's right fit. Once you hit the roads, gradually wear your shoes until you become comfortable wearing it in your day-to-day activities and running sessions. Are purple running shoes better than other colors? When choosing to buy a running shoe that fits your specific needs and personality, the color may be a factor, especially when the user gives importance to the style and design of the footwear. We cannot say that blue, red, white, black or silver running shoes are better than the purple footwear. It depends on the wearer's preferences. One runner may find the purple footwear to be better, but another user sees the red running shoes to be more attractive. We should keep in mind that every user has different opinions when it comes to color schemes. It is then vital that we respect each other's choices. Why do purple running shoes fit differently from brand to brand? Not only do all shoe brands fit differently, but shoes within each brand also fit differently. It is also built on a wide variety of footwear lasts which can be wide, slim, shallow or deep. Companies use the 360° models of the foot to make each shoe unique regarding the fit. One of the effective ways to know and determine the right fit for the runner is to try the shoe on. Ask any staff of the store to help you find the right shoe last and brand for you. Is it expensive to buy a purple running shoe? The price of a shoe does not only depend on its color. There are a lot of things to consider when pricing a shoe including its popularity, brand, quality, performance and features. The price of a shoe maybe a little higher if it’s a limited or special edition. But, it doesn’t necessarily mean that a purple running shoe is more expensive than a red, silver, green, black or blue running shoes. Is it safe to wear my purple running shoes at night? You can always wear your purple running shoes when you prefer to run at night. Just be attentive and mindful enough to choose the safest roads or trails to do your running activity. Take a lot of care especially when going to places which have low-light conditions to ensure your safety. Buying a reflective purple running shoe is also an option. This will make you more visible at night.